USBSecure Professional was published in the german c't - magazine (Heinz Heise publishing, No 4, 2006). 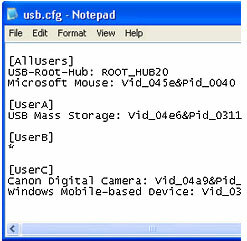 Worldwide, the software is already being used in more than 2,500 companies as a USB security tool. In enterprise networks the path for files entering the network is normally restricted by a security policy. The network is protected with firewalls and fileblockers, disk and CD drives are locked. In Windows 2000 / XP / 7 USB ports pose a threat for your company network. The ports are required for several devices like scanners and printers. SLCheck 2.1 is a free command line monitoring tool for Windows operating systems. It can be used to monitor Internet web servers, local intranet servers, mail servers, FTP servers, POP3 / IMAP4 servers, Citrix servers etc. It can perform a HTTP check on Port 80 for monitoring your internet connection (test internet connection) by requesting two URLs periodically. This utility can help you to measure and improve your service quality by creating service level reports. All requests are logged in a comma separated file. If you would like to work without additional tools please read our article Telnet SMTP commands. You can also check out for our Device Manager Remote. www.lugrain.de/wake-on-lan-tool - Das Wake on Lan Tool für Administratoren. www.displaytool.de - Große Dateien öffnen mit DisplayTool. www.bienen-wespen-und-hornissen.de - Unterschied zwischen den Insekten. www.propolis.de - das natürliche Antibiotikum.